When it comes to natural stone thresholds and windowsills, not all slabs are created equal. While the initial products may look similar, the fact is that different quarrying, manufacturing, and even shipping practices can have a drastic impact on the finished product and final cost. Before you decide to save a little money by going with cheap tiles of unknown quality, here are a few things you might want to keep in mind. Getting the marble out of the ground can be tricky. It takes a great deal of skill and even the use of state-of-the-art equipment to determine the best locations for drilling into slabs and quarrying the products. Some suppliers approach this method with the goal of pulling out as much material as possible, but we take a different approach here at Stonexchange. Our ultimate goal is to produce as much quality, usable marble as possible. This means that we look for the most appropriate areas to cut, and we work around what nature is providing us. This allows our team to provide people around the country with quality pieces that are more stable and will last for many years to come. The stones come out of the ground as rough rocks, and it’s up to the manufacturing professionals to transform those rocks into functional shapes and sizes. This is a skill that’s crafted and fine-tuned over several years. We employ highly skilled artisans who treat the manufacturing process like the fine craft that it is. We take the time to carefully examine stones and determine where the cuts should be made. Our goal is to minimize weak areas while producing a stunning finished product that our clients will appreciate. While other companies may start blindly cutting without worrying about weak spots, we believe that the careful inspection and quality control measures start the moment the stones are located in the ground the quarried. The result is that Stonexchange consistently delivers stones that are of superior quality. Here at Stonexchange, we’re able to maintain tight quality control standards from the point of origin to the final destination. This allows us to avoid problems that can arise during manufacturing, shipment, or even storage. We care about customer satisfaction, so we want to ensure that our clients receive the high-quality, durable thresholds they expect. When you work with retailers who are at the end of a long line of wholesalers, then you may run into more problems with low-quality tiles that just aren’t suitable for residential flooring purposes. However, when you order from our company, you can rest assured that there will be minimal damage and most of the thresholds will be ready for immediate installation. They say that you get what you pay for, and that goes for customer service as well as products. Other companies have a high turnover and the staff may not be very knowledgeable about thresholds or other marble products. Our highly skilled team is always available to assist you. We’ll work closely with you to ensure that you order everything you need, and we’ll carefully confirm your order before shipment to ensure that it’s correct. You can rest assured that your merchandise will arrive in a timely manner and that the order will be filled correctly. When the shipping container has the right colors and sizes, you can get right to work again rather than losing any time trying to deal with replacements or other issues. The most likely place for damage to occur is in the shipping containers. Other companies try to save and cut corners through the shipping process, but we believe that this is one area where it’s better to spend a little more to better protect the stones. We work with nationwide shippers in order to offer prompt delivery, and we take great care with packaging our crates to minimize the risk of damage. Spacers and padding are used to reduce vibrations and minimize the risk of stress cracks or other damage. Our customers see the difference when the crates arrive and most of the products are intact and ready for installation. Marble is a natural material, and it’s bound to have some tiny cracks and fissures in the stone. Most of these are part of the beauty, and they don’t affect the structural integrity of the stone in any way. Others, however, will make the stone weaker and increase the likelihood of breakage. We take pride in our attention to detail, and we check every stone carefully for these imperfections. Products are only cleared for sale when we’re confident that they meet our high standards. Other manufacturers don’t take this level of pride in their work. Rather than looking for high-quality stones, they use subpar materials to fill the cracks and hope that they’ll go unnoticed. As a consumer, you won’t be able to tell the difference until the products are installed and you start having problems after regular use. You can avoid this potential issue by working with a reputable company that’s known for delivering high-quality thresholds and other products. We’re one of the most trusted names in the industry because believe in delivering excellence with every order. However, it’s our prices that first-time customers really appreciate. Normally, you have to choose between great pricing and quality products, but that’s not the case with Stonexchange. We maintain tight cost-control measures through every stage of the process, and we pass those savings on to our customers through attractive, wholesale pricing. 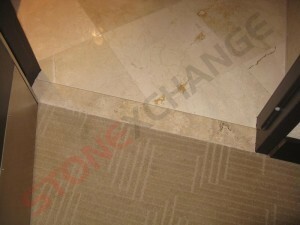 Contact us today to speak with our professionals and place an order for your luxurious marble thresholds.